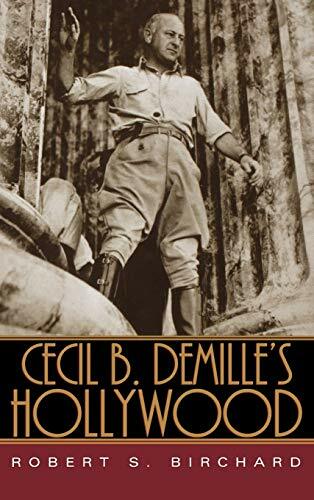 Cecil B. DeMille was one of Hollywood's most successful and consistent directors, and yet since the rise of "auteurist" criticism, he has been resigned to the critical doldrums, considered at best a decent showman and at worst a pandering sellout. Film editor and historian Robert S. Birchard ("King Cowboy: Tom Mix and the Movies") has now made a long overdue attempt to correct that view. Birchard's exceedingly well-researched book tells DeMille's story through the films themselves rather than through a standard biography format. By means of behind-the-scenes stories we learn about DeMille the tyrant and DeMille the benevolent who liked to work with the same cast and crew again and again. Birchard analyzes the filmmaker's political leanings and crosses it with his behavior at certain events (like a couple of particularly fiery Director's Guild meetings). Birchard also provides financial information, and we learn that DeMille was not always in the black and did not always please his employers. Likewise, he was not always drawn to spectacles, and made all kinds of films over the course of his career, including Westerns, comedies and melodramas. Through expert detective work, Birchard studies only the cold, hard facts and makes careful inferences about why DeMille may have chosen a certain film or cast a certain actor or made a certain decision � all of which only serves to deepen and enrich an artist formerly seen as shallow and useless. This is a truly superb book, written in an original and refreshing style that fills a definite void. Hopefully with the help of these pages, future scholars won't make the mistake of misjudging or dismissing DeMille any longer.